TOKYO – Asian shares rose on Friday following gains on Wall Street, while the dollar firmed after facing pressure from a rise in the yuan, but gains were capped by uncertainty over whether the Federal Reserve will raise interest rates next week. MSCI’s broadest index of Asia-Pacific shares outside Japan was up about 0.8 percent, and on track to rise more than 3 percent for the week. Chinese shares got off to a wobbly start, with the CSI300 index and Shanghai Composite Index up slightly by late morning after bobbing in and out of negative territory. Investors are awaiting Chinese industrial output, retail sales and investment data on Sunday for clues on whether the world’s second-largest economy is continuing to lose momentum, which could set the tone for trading next week. Japan’s Nikkei stock index dipped 0.1 percent, but pared earlier losses and was poised to end a choppy week more than 2 percent higher, even as investors remained cautious. 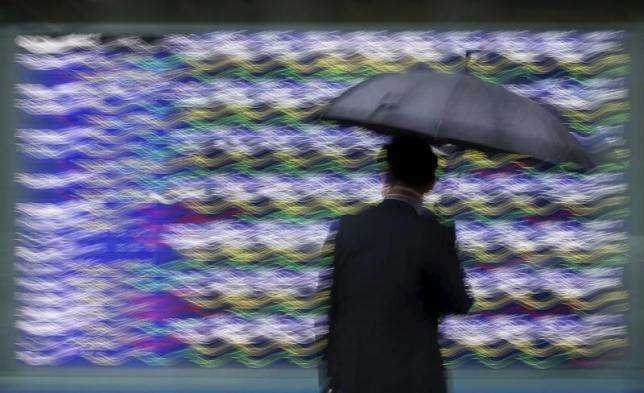 TOKYO – analyst at Mizuho Securities, who expected investors to continue unwinding their positions. “Even if stocks jump, we don’t know if and how long the rally will last so it’s safe to reduce positions in an environment like this,” Miura said. Government data released before the market open showed that large Japanese manufacturers’ sentiment turned positive in the July-September quarter, suggesting that companies were taking China’s recent slowdown in stride. U.S. data on Thursday suggested the labor market was gaining momentum in early September as fewer Americans filed for weekly unemployment benefits, but a separate report showed weak inflation, further clouding the outlook for what the Fed will decide to do at its Sept. 16-17 policy meeting. “Based on the performance of the U.S. economy alone, the Fed should raise rates but they do not operate in a vacuum,” said Kathy Lien, managing director at BK Asset Management in New York. Considering volatile global equities, a dovish European Central Bank and actions by other central banks, it will be difficult for the Fed to act, she said in a note to clients. The dollar index, which tracks the U.S. unit against a basket of six major rivals, edged up about 0.1 percent to 95.523. The dollar rose about 0.2 percent higher against the yen to 120.81, while the euro was nearly flat from U.S. levels at $1.1281. The greenback came under pressure overnight as China’s yuan shot higher in offshore markets on what was suspected to be rare intervention by Chinese state banks, likely taking aim at speculators betting on further falls in currency after its surprise devaluation last month. U.S. crude was down about 0.2 percent in Asian trading at $45.82 a barrel, after rallying 4 percent on U.S. Energy Information Administration data that showed strong demand for gasoline. Brent, which gained 2.8 percent in the previous session, was slightly lower at $48.87.